On Monday, Russia’s top diplomat threw cold water on Tokyo’s hopes for a quick return of disputed islands in the Pacific, warning Japan that it must recognize them as part of Russia’s territory as a starting point for talks. 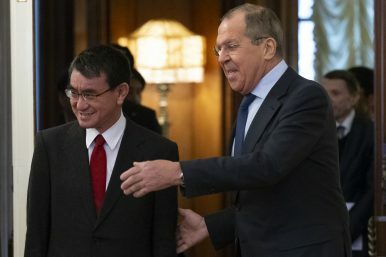 The stern statement from Foreign Minister Sergey Lavrov, which followed the talks with his Japanese counterpart Taro Kono, appeared to reflect Moscow’s efforts to temper Japanese expectations of an imminent deal. It sets a tough stage for Japanese Prime Minister Shinzo Abe’s trip to Moscow for talks with Russian President Vladimir Putin later this month. Abe has recently voiced hope that this year will mark a breakthrough in solving the territorial dispute and spoke about an imminent change in the islands’ status — remarks that angered Moscow. Speaking at the start of the talks, Kono emphasized that the two countries need to solve the territorial problem to set stage for expanding their economic and other ties. But reflecting sharp differences at the talks, the Japanese delegation has scheduled a separate briefing later in the day. The Japanese have long argued that for a peace treaty to be signed, the territorial issue has to be settled first. The Russian side, in contrast, has stressed that the territorial issue isn’t up for debate and has pushed for work on the peace treaty, without preconditions. Putin and Abe agreed in November to accelerate negotiations based on a 1956 Soviet proposal to return two of the islands to Japan but Lavrov’s somber tone indicated that Japanese expectations of a quick breakthrough were premature. Speaking after the talks, he said Moscow saw recent statements from Abe as unacceptable. The Russian diplomat said he also drew Kono’s attention to a statement by Abe’s political aide suggesting that solving the territorial dispute with Russia would help efforts by Japan and the U.S. to deter China. Many Japanese policymakers view China as a much bigger threat than Russia and see the settling of a peace treaty with Moscow as a way to strengthen Tokyo’s position in the region. He noted that the Soviet Union had proposed returning the two islands to Japan before Tokyo struck a military alliance with the U.S. in 1960, and the American military presence in Japan has changed the situation. Lavrov noted that Russia is concerned about the U.S. military buildup in the region, including the deployment of U.S. missile defense components that he said create security risks for Russia and China. In November 2018, Abe told Putin that if the islands were returned to Japan, Tokyo would not allow the U.S. to build military facilities on them. At the same time, the Japanese procurement of two U.S.-made land-based Aegis Ashore ballistic missile defense batteries in summer 2018 raised concerns in Moscow. In December 2018, Japan officially logged a protest with Russia over the construction of four barracks on two islets in the disputed territory. By Vladimir Isachenkov of the Associated Press with additional reporting by The Diplomat. Furthermore, the Russian president does not rule out a U.S. troop presence on the disputed islands if controlled by Japan.